Hop-on and hop-off around Rome on open-top buses and experience unobstructed views of attractions from your unique vantage point while you learn about the city’s vast history and rich culture with the help of an onboard audioguide available in 8 different languages. Additionally, enjoy unrestricted 24 or 48-hour access to Rome's public bus system, ATAC, giving you a chance to visit almost all corners of the city like a true native! Enjoy the benefits of the 24 or 48-hour ATAC Ticket and reach every nook and cranny of the city by public transport. Validate the Open Bus ticket and the ATAC ticket on different days, allowing you to enjoy almost 96 hours of unrestricted access to transfers around Rome. Savor the best of Rome from an open-top bus, with Hop-On Hop-Off tickets giving you maximum flexibility. Hop on and off at your leisure as many times as you’d like for the entire duration of your ticket. Learn about Roman wonders with a multilingual audioguide while you enjoy breathtaking, panoramic views from either the upper deck of the bus. Buses run at intervals of 15 minutes so you don't ever have to wait for too long! Free WiFi on board and a detachable roof to operate in all weather conditions for a worry-free experience! To further enrich your experience, take advantage of the free map of the Bus Routes, which you can view here. 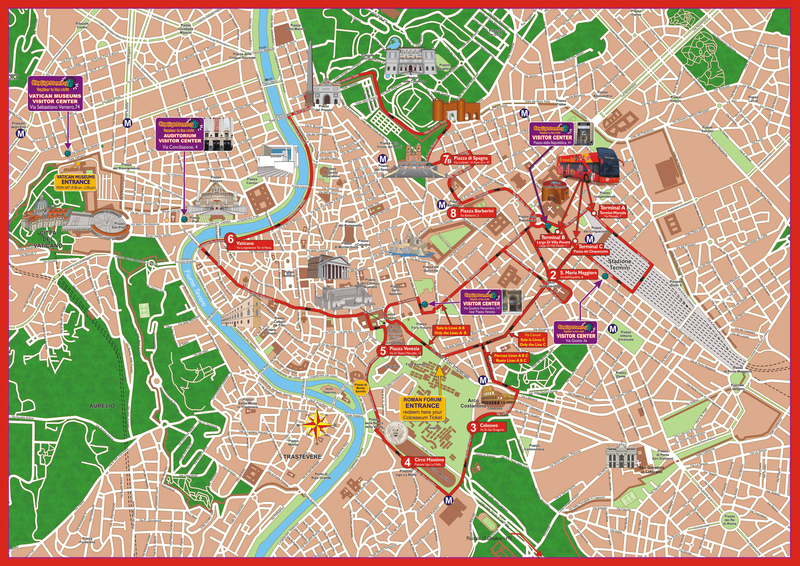 Go around the city in bright red Hop-On Hop-Off double-decker buses with an open top, so you can enjoy the pleasant Italian weather as you discover the numerous sights of Rome from your unique vantage point. The bus will have live commentary in 8 different languages, which will give you excellent insight into the history and culture of each for the monuments and will help you understand their significance. During the journey, you will go past colorful markets, quaint neighborhoods, churches and a number of art museums and monuments. With the Hop-On Hop-Off ticket, you can board and deboard the city sightseeing buses as many times as needed. This gives you the flexibility to choose your own timings and spend as much time as needed at each of the attractions. You will also be given ATAC (Rome’s public transport company) tickets, which are valid for 24 hours or 48 hours depending on your choice of pass. These tickets can be used to travel to the various parts of Rome using several forms of public transport, such as the regional railways, metro lines, bus, trams, and trolleys. The city is small enough for you to easily visit its most famous attractions in the course of 3-4 days, which is how long you'll be able to use both tickets for if you redeem them on different dates. View a full map of the Open Bus Route and Visitor's Center here. ATAC and unlimited Hop-On Hop-Off Open bus pass valid for 24 or 48 hours, depending on the variant chosen. 24-Hour Pass - You will get a chance to travel around Rome over the course of one day, with Hop-On Hop-Off tickets and ATAC tickets that are valid for 24 hours. 48-Hour Pass - You will get a chance to visit the city of Rome over 2 days, with Hop-On Hop-Off and ATAC tickets that are valid for 48 hours. You may board any of the double-decker buses from any stop. Present a printout of your ticket voucher to the driver to redeem your bus pass. Stop #3: Colosseum - Purchase entrance tickets here. Stop #8: Via Ludovisi & Via Veneto - Purchase entrance tickets here. Rome is a lively capital city and therefore political events, demonstrations and celebrations can disrupt the itinerary at any time, especially during special events, holidays summer and at weekends. There may be delays, reduced frequency and route alterations due to traffic congestion and road closures. You will receive an email confirmation with your Rome Hop-On Hop-Off Bus + Public Transport Pass ticket voucher shortly. Please take a printout. Show the printout with a valid photo ID on board any of the sightseeing buses or any of the Visitors' Centers to avail your Hop-On Hop-Off and ATAC tickets. View a full map of the Bus Route and Visitor's Centers here. The Hop-On Hop-Off tickets and ATAC tickets are valid for a period of 24 hours or 48 hours depending on your choice of variant. The validity will begin from the first time you use each respective service.